Stay Away From the Ocean: As in oceanfront rentals. Many vacationers love renting NC beach homes on the oceanfront. Opt for more affordable rentals on the second row or maybe even several streets off the oceanfront and you’ll realize significant savings. Plus, beach access points are conveniently located all along the Crystal Coast and make it easy to reach the beach from almost anywhere on the island. Shorten Your Stay: Instead of a two week vacation, make it for one week. Dine in More Often: When you do come, be frugal and eat in more often. Now this doesn’t have to mean more time in the kitchen for the family chef. Many Crystal Coast rental properties provide a grill and many of the Emerald Isle condos offer picnic and grilling stations. Then plan one or two special “go out to eat nights” to spice up your stay. Don’t forget to grab any of the many local magazines that offer discount coupons for eats and activities. You’ll find them everywhere on the Crystal Coast. Be Free: As in come to the Crystal Coast when special “FREE” local events are scheduled making your trip more affordable. 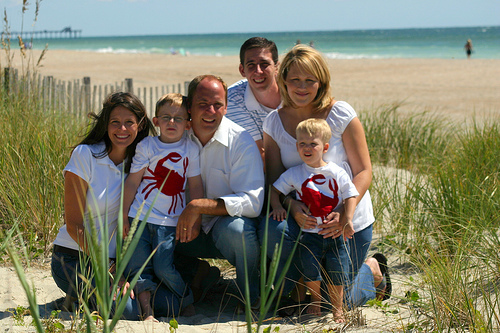 Maximize Your NC Beach Trip: Make it a real family affair. Hang out more at your rental and play board games, have special craft times using our local resources like shells and sand. Plan fewer costly activities that can ding the pocketbook. Downsize: Select a smaller Emerald Isle beach house or Emerald isle condo for your stay. GO BIG: Invite many friends and relatives to come stay and share the cost. The Beach Layaway Plan: Well that might be a stretch but some Crystal Coast vacation rental agencies are allowing their renters to set up a payment plan for deposits and rentals. Fall Back or Spring Ahead: Instead of paying for the peak summer rental season, maybe consider scheduling your Emerald Isle vacation for the spring or the fall months. These rental seasons are called ‘the shoulder months” and they offer consider savings over the prime summer months. Do It Yourself Vacation: Instead of splurging on options like renting sheets, towels, and beach chairs, bring your own. Another popular option is to bring your bikes. With the great bike paths in Emerald Isle, you and your family can easily reach almost any short distance destination people could normally reach by car. These money saving tips are sure to make a big impact on your vacation budget. Let me know which one you think is your favorite. If I missed a money saving tip, feel free to add yours to the list. Are You Waiting for Sweeter Deals to Book Your Crystal Coast Vacation? It’s been 9 months since I originally asked this question in a post I wrote May 18th 2008. The problem is we are still asking the same question in 2009.